The bumper haul of new worlds includes 16 "super-Earths" - planets with a greater mass than our own, but below those of gas giants such as Jupiter. One of these super-Earths orbits inside the habitable zone - the region around a star where conditions could be hospitable to life. 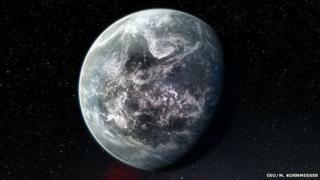 Lead author Dr Michel Mayor, from the University of Geneva in Switzerland, said the haul included "an exceptionally rich population of super-Earths and Neptune-type planets hosted by stars very similar to our Sun". He added: "The new results show that the pace of discovery is accelerating." "These planets will be among the best targets for future space telescopes to look for signs of life in the planet's atmosphere by looking for chemical signatures such as evidence of oxygen," said Francesco Pepe, from the Geneva Observatory, who contributed to the research. It is located at the edge of the habitable zone - the narrow strip around a star where liquid water can be present on the surface of a planet. Liquid water is considered essential for the existence of life. Harps (High Accuracy Radial Velocity Planet Searcher) is a precision instrument known as a spectrograph that is installed on the 3.6m telescope at Chile's La Silla Observatory.